Hitachi Software Engineering America has debuted its new StarBoard FX 77 Duo, an interactive whiteboard that supports multiple simultaneous input. 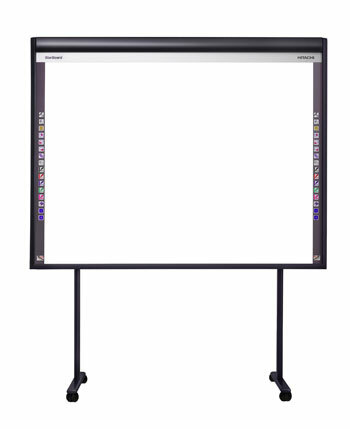 Targeted toward the education and presentation market, the whiteboard uses Hitachi Soft's StarBoard software to allow multiple users to interact with the device at the same time and to allow for gestural control of presentation materials. The 77-inch StarBoard FX 77 Duo supports dual input from presenters' fingers, styluses, or other devices. Input is managed with an image sensor system that houses all electronic components in a single, replaceable unit. Support for content on Hitachi Software's Online Open Educators' Resource Center, which includes state standards-aligned lesson plans, graphics, and templates. The StarBoard FX 77 Duo is available for $1,999 with support for Windows-based PCs, including Vista.